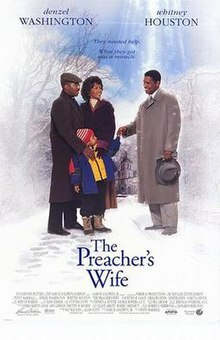 The Preacher's Wife is a 1996 American family film directed by Penny Marshall and starring Denzel Washington, Whitney Houston, and Courtney B. Vance. It is a remake of the 1947 film The Bishop's Wife, which in turn was based on the novel of the same name by Robert Nathan. It was nominated for the Academy Award for Best Music, Original Musical or Comedy Score. The film was nominated for five Image Awards, including Outstanding Motion Picture, and won two—for Best Actress (Whitney Houston) and Best Supporting Actress (Loretta Devine). A voiceover by the child Jeremiah (Justin Pierre Edmund) guides the viewer through the film. Rev. Henry Biggs (Courtney B. Vance) is the pastor of a small struggling Baptist church in a poverty-stricken neighborhood of New York City. Membership is declining, Henry is pulled in a hundred directions by his parishioners' needs, and the church's finances are in trouble. Henry is under intense pressure from real estate developer Joe Hamilton (Gregory Hines) to sell the church's property so that Hamilton can build luxury condominiums on the site. Henry has also become neglectful of his wife, Julia (Whitney Houston), and his son, Jeremiah. Julia worries that her marriage is failing. Unsure that he can make a difference in his parishioners' lives and beginning to lose his faith, Henry prays to God for help, which comes in the form of Dudley (Denzel Washington), a witty and debonair angel. Dudley tells Henry that he is an angel sent by God to help him, but Henry is deeply suspicious of Dudley. Julia, however, is instantly charmed by the handsome and unflappable angel. With Christmas approaching, Henry's schedule becomes increasingly burdensome, and Dudley begins to spend most of his time with Julia and Jeremiah. Rev. Biggs' secretary, Beverly (Loretta Devine), becomes comically defensive and aggressive, believing Dudley is there to take her job. Julia's wasp-tongued mother, Margueritte (Jenifer Lewis), is also suspicious of Dudley, because she believes the newcomer will break up her daughter's marriage. Dudley and Julia go ice skating, and then later spend an evening in the jazz club where Julia once performed. After Henry confronts Dudley, Dudley realizes that he is falling in love with Julia. So, Dudley turns his attention to Hamilton and manages to disrupt his schemes to get Henry to sell the church. Henry now realizes that his family is the most important thing in his life, and he resolves to be a better husband and father. At the church's Christmas pageant, Henry finds his faith in God renewed and ties to his family restored. With his work done, Dudley gives the Biggs family a fully decorated Christmas tree as a gift. Dudley then erases all memories of himself from everyone he has met, and although he attends midnight service on Christmas Eve, no one recognizes him. However, Jeremiah, who has the faith of a child, still remembers Dudley, and wishes him a merry Christmas. A subplot present throughout the film focuses on Julia's singing talents. Once a popular nightclub singer, she is now a star in the church choir. This subplot provides for several set pieces in which the choir performs, and Gospel music plays a significant role. It also provides comic relief in the form of a domineering choir member, played by Houston's real life mother, Cissy. The motion picture was developed by Denzel Washington's Mundy Lane Entertainment. The screenplay was written by Nat Mauldin and Allan Scott. Credits are given to Robert E. Sherwood and Leonardo Bercovici for the 1947 film The Bishop's Wife, and to author Robert Nathan (for his novel The Bishop's Wife). The role of Julia was written with Whitney Houston in mind, though she had not been approached to star in the film yet. Denzel Washington says that he first considered Julia Roberts for the role, but quickly turned to Whitney Houston. Houston admitted that she was reluctant to accept, feeling she could not do justice to a role that required her to play a dowdy housewife. Only after reading the script a second time and seeing parallels between her own life and the role of Julia did Houston accept. Houston was paid $10 million to appear in the film. Production was plagued by poor weather and accidents. Houston later admitted "in an interview with Oprah Winfrey in 2010, [that] by the time 'The Preacher's Wife' was released, '(doing drugs) was an everyday thing." Interior sets were constructed at Chelsea Piers, a film and television production facility in Manhattan, New York. Severe snowstorms in New Jersey (where scenes were shot in Paterson) and New York (where scenes were shot throughout New York City) cost the production several shooting days. Later, the cast and crew moved to Portland, Maine, to scenes which occur at an ice skating rink, but unseasonably warm weather turned the ice to water and forced the production to rent snow-making machines. The production filmed in several crime-ridden areas of New York City to achieve authenticity. Robberies were common in the area, leaving the cast and crew nervous. While filming exteriors and interiors at a church and parsonage in Yonkers, New York, a building a block away caught fire and two children died. One crew member rushed a ladder from the production to the burning building, and saved the life of a four-year-old child. Accidents also affected the production. The weekend before filming began at the church, an elderly parishioner fell, broke her hip and died. In the middle of filming, a crew member was struck by a car and killed. The production schedule was also compromised after Houston refused to sing in the mornings. Filming was scheduled to wrap at the end of February, but the crew was still shooting at the beginning of May. Some final scenes shot were those at the Main Street cafe in Tarrytown, New York. The entire street had to be dressed for Christmas in fake snow laid down along the street. Lionel Richie made his acting debut in the film as the owner of the jazz club. The Preacher's Wife: Original Soundtrack Album is the best-selling gospel album of all time. The soundtrack also remained at number one for a record twenty-six weeks on the Billboard Top Gospel Albums Chart. The Georgia Mass Choir appears in the film. The soundtrack to the film (performed by Whitney Houston) consists of gospel numbers and includes performances by Monica, Faith Evans, the three members of New Edition who embarked on solo careers (Bobby Brown, who was Houston's real-life husband at the time, Ralph Tresvant and Johnny Gill), Cissy Houston and Shirley Caesar among others. Stephen Holden, writing for The New York Times, called the film "sweetly uplifting" and "a shrewdly conceived update", and had high praise for actress Jenifer Lewis and the funny scene where the children in the Christmas pageant cannot recall their lines. Kevin Thomas of the Los Angeles Times also found the film "warm, sentimental, amusing yet serious" and an "inspired reworking" of the 1947 original. He singled out Penny Marshall's directing for being "consistently wise and judicious", and praised Jenifer Lewis and Loretta Devine. Critic Roger Ebert gave the film 3 out of 4 stars, but was a bit equivocal in his review, concluding: "The Preacher's Wife is a sweet and good-hearted comedy about the holiday season. ... This movie could have done more, but what it does, it makes you feel good about." Duane Byrge, writing for The Hollywood Reporter, also felt the film uneven. Although he found it heart-warming, he wrote that it had a "patchy narrative" and felt the film made Washington and Houston such great characters that it was hard to see why the Biggs' marriage should survive. Too often, he concluded, the plot seemed nothing more than a means of stringing together terrific musical performances by Houston and the Georgia Mass Choir. Byrge found Penny Marshall's directing slow at times but felt that casting director Paula Herold had done wonders. He singled out Courtney B. Vance as an appealing if downbeat husband, Jenifer Lewis as the "sassy" mother-in-law, and Loretta Devine as Bigg's defensive, aggressive secretary who thinks Dudley is there to replace her. Marshall, Byrge said, was more effective directing these lively characters (and actors) than the film's stars. In contrast, Caren Weiner Campbell, writing for Entertainment Weekly, found Denzel Washington to be lackluster (though the gospel singing scenes were quite good). Her strongest criticism was directed at the screenplay. She felt the script had too many subplots, with the narrative by the character of Jeremiah was "sappy", and was lacking in the "fun miracles" of the original. She also criticized Marshall's directing for being slow and tedious. Unlike other reviewers, Jackie Potts in The Miami Herald felt the characters were dated and not updated. She found Courtney B. Vance's acting humorless, and was highly critical of Whitney Houston's acting. "[Houston] sleepwalks through scenes as the dignified mother, doing little more than tucking her 6-year-old son (Justin Pierre Edmund) in. It's not a showy role, but Houston plays it as if the frost outdoors has settled on her shoulders." While she had high praise for Denzel Washington (he "plays Dudley with a 100-watt smile and childlike sense of wonder"), she had little for Penny Marshall's directing. It was, she concluded, slow and the overall tone of the film "strangely solemn"—with only minor relief given by Jenifer Lewis' biting, scathingly funny turn as a tart-tongued mother. The Preacher's Wife currently holds a 61% rating on Rotten Tomatoes based on 44 reviews. The film grossed $48,102,795 in the US. ^ Patrick Goldstein (December 11, 1996). "Praying for Crossover Appeal". Los Angeles Times. Retrieved August 7, 2012. ^ a b c d John-Hall, Annette. "'Cool, Real Cool'." Philadelphia Inquirer. December 15, 1996. ^ a b "The Rise and Fall of a Superstar: Tragic Tale of the U.S. Singing Sensation Whose Life Was Destroyed By Drugs." The Daily Mail. 13 February 2012. Accessed 2012-11-21. ^ Lawson, Terry. "Whitney Houston Says She Was Reluctant to Star in 'The Preacher's Wife'." Detroit Free Press. December 20, 1996. ^ McGlone, Peggy. "Divine Hosts, Generous Guests." Newark Star-Ledger. December 13, 1996. ^ a b c Staudter, Thomas. "How Main Street Cafe Got in the Movies." New York Times. May 26, 1996. Accessed 2012-11-21. ^ a b Ascher-Walsh, Rebecca. "Preacher's Strife." Entertainment Weekly. December 13, 1996. Accessed 2012-11-21. ^ "Teen-Agers Charged in Fatal Yonkers Fire." Associated Press. February 23, 1996. ^ a b Thomas, Kevin. "A Heavenly Persuasion." Los Angeles Times. December 13, 1996. Accessed 2012-08-07. ^ Elysa Gardner (1996-11-24). "Oh, Whitney-for Heaven's Sake - Los Angeles Times". Articles.latimes.com. Retrieved 2012-08-07. ^ Holden, Stephen. "Movie Review - The Preacher's Wife." New York Times. December 13, 1996. Accessed 2012-08-07. ^ Ebert, Roger. "The Preacher's Wife." Chicago Sun-Times. December 13, 1996. Accessed 2012-08-07. ^ Byrge, Duane. "Movie Review: 'The Preacher's Wife'." The Hollywood Reporter. December 9, 1996. ^ Campbell, Caren Weiner. "'The Preacher's Wife' Review." Entertainment Weekly. April 25, 1997. Accessed 2012-08-08. ^ Potts, Jackie. "'The Preacher's Wife' Could Use A Prayer." The Miami Herald. December 13, 1996.